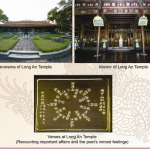 The Royal Literature on Hue Royal Architecture consists of 2,679 verses and picture panels located in thirteen buildings in the Royal City in Hue, Vietnam. 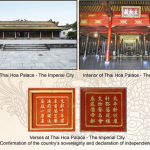 The buildings were constructed from 1802 to 1945 and the verses were chosen from the works of the Nguyen emperors at the time each building was constructed. They are arranged in two configurations, either with one verse panel and one picture panel side by side, or one character panel and one picture side by side. The picture panel is decorative and not an illustration of the verse panel beside it. The verses cover the many changes in Vietnam during the time they were composed. 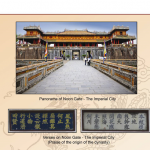 Topics covered include independence, sovereignty, Confucian teachings, the Nguyen emperors, international relations, ancestors’ merits, weather, harvests and the beauty of Vietnam. 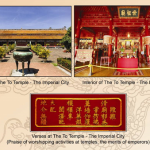 The To Temple has 685 verses, which is the most of any of the structures, and the Noon Gate has the least, with 8 verses.